Will is a 30-something website manager who uses local cafe, Coffee Town, as his office. 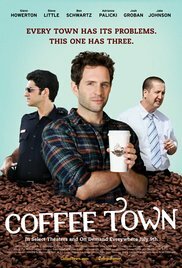 When the owners of the shop discuss plans to convert Coffee Town into a bar, Will enlists the help of his two best friends Chad and Gino to save his freeloading existence. In order to thwart the plans of Coffee Town’s owners, the trio stages a robbery to create the illusion of an unsafe neighborhood not suitable for the proposed venue. American humor doesn’t really appeal to me (excluding the sitcom Friends), but this movie gave me some chuckle and smile moments. And really tears of laughter with the robbery itself. A freelancer who uses a coffee shop as office, a nerd who abuses his smoke break and a crazy cop. These are the protagonists this movie is all about. A concatenation of weird conversations and one-liners. No real knee-slapper, but fortunately there isn’t any vulgar humor.